I have always loved fresh flowers, so when I saw an offer for a 1 day floristry course pop up I thought, why not! 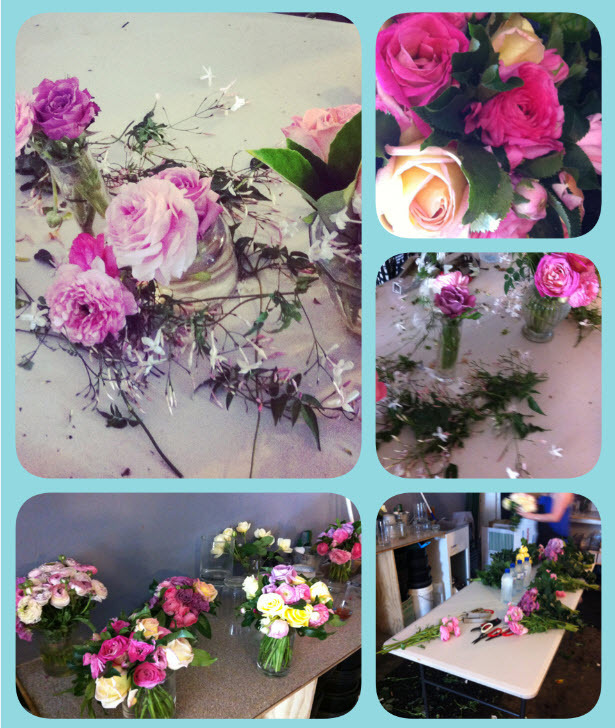 The class was held at Maggie May flowers at Bondi beach by one of the owners of the shop. We started with glasses of some pretty pink rose’( how appropriate) and cheese and wine and learned how to prepare the flowers by removing thorns, and excess leaves from each flower stem so they were easy to handle and so the lower leaves did not rot and taint the water. It is also good to cut your stems on an angle so there is a larger surface area to absorb water and keep them alive longer. We learnt how to make larger display style bunches, starting with a lot of Leaves and foliage as a background and then slowly adding our feature flowers in the middle. We also learnt how to make small posies and hair flower pieces and corsages. The florist mentioned that in more recent years the trends have moved towards less neat and perfect bouquets to more rustic, thrown together, different texture bunches displayed uniquely using different objects like tin cans, old glass jars, bottles, metal wine coolers and more. We know already how I love flowers in glass bottles, so I was particularly impressed with her use of jars and grabbing some jasmine and just placing it along the table as a beautiful floral centrepiece around your flowers and candles. You could do Ivy at Christmas time also. I just love the look of this and will definitely incorporate this into my next dinner party and maybe even my wedding. Of course with any good flower project create your bunches and centrepieces on the day so they are still vibrant for the occasion and always have cheese and wine handy!! I am always on the lookout for new and different ways to decorate my home. I came across these mini milk bottles and could not resist using them for my flowers. Fantastic for dinner parties too!